While working on a ServiceNow IT Asset Management deployment for a Fortune 500 client, we ran into an issue trying to handle stockrooms with sub-locations within the stockroom. Being a large organization, our client uses a hub-and-spoke model for their stockrooms – one central stockroom that supplies assets to a number of local stockrooms. Due to the size of the central stockroom, it’s imperative to use a hierarchical stockroom structure to increase visibility to the physical location of an asset within the central stockroom. The central stockroom that my team was working with already had an extensive hierarchy of locations. We were assigned with capturing this information on the asset form. Why Not Use the Location Field? Our team was wary of using the location field on the asset, due to the way that ServiceNow auto-populates the location field on the asset. Out of the box, ServiceNow will automatically populate the Location field of an in-stock Asset with the Location of the stockroom. Without rewriting the auto-population logic, any changes to the Location field would get overwritten. Overwriting the auto-population logic would have been difficult to implement, and incurred maintenance costs during upgrades. Also, this was an intrusive change to the system, so we investigated alternatives. Our first effort was implementing a hierarchy within the stockroom field. We added a Parent field to the stockroom form, allowing a hierarchy to be created under the top-level stockroom. With this scheme, the stockroom field would be the lowest stockroom in the location hierarchy within the central warehouse. All stockrooms in the hierarchy had the same location for reporting purposes. Unfortunately, there were two major flaws with this approach. The major problem with implementing a stockroom hierarchy is that two major existing features break due to the laptop being in the “A” Stockroom instead of the “Hub” Stockroom. The first way that the stockroom hierarchy breaks the out of box functionality is on transfer orders. In our example, let’s say that we wanted to create a transfer order to move the laptop from the Hub Stockroom to a “Spoke” stockroom. We would create a transfer order to go from Hub Stockroom to the Spoke stockroom. Out of the box, when a Transfer Order is created in ServiceNow, it will filter the assets that you can add to a Transfer Order Line to only show the assets that exist in the From Stockroom, which is usually a good thing. However, in this Stockroom Hierarchy model, the laptop would be in stock in the “A” stockroom, a child stockroom of the Hub Stockroom, so the laptop would not show as an option to be added to a transfer order line. This leads to two clunky workarounds for members of the Hub Stockroom. They can either set the transfer order to originate from the “A” stockroom, which may be confusing to the stockroom that’s receiving the inventory (What’s the “A” stockroom?) The other workaround is for the members of the Hub Stockroom to go to the laptop asset and manually update the stockroom to the “Hub Stockroom.” This is a feasible solution for this small example, but the extra work adds up quickly, especially for the hub stockroom, which is probably processing dozens of orders a day. The hierarchical stockroom model also breaks stock rule functionality. In our example from above, let’s say that there is a stock rule that will transfer assets of the model of the laptop that is in the A stockroom to one of the “spoke” stockrooms. If the spoke stockroom is below the threshold, the stock rule will be triggered, and the stock rule will look for assets of that model type in the Hub Stockroom. However, in this example, the laptop asset in in the A stockroom, not the Hub Stockroom. The stock rule will look in the Hub Stockroom, not find any assets, and no transfer orders will be created until the laptop is moved into the Hub Stockroom. Because the stockroom is the Hub Stockroom, the transfer orders and stock rules will work as expected. I believe that hierarchical stockroom structuring is a gap that is currently missing from ServiceNow, as there is no obvious way to capture this information without adding new fields to the form. Through trial and error, we determined what we believe is the best way to overcome this issue. Hopefully this method will prove useful until ServiceNow is able to fix this problem. This article has been cross-posted on my company’s blog here. We had an issue come up on client-site today about the ServiceNow Vendor Restocking notification. This is the notification that comes up when Vendor Stock Rules fire. Our client is using the out-of-box version of the notification. Our developer investigated, and discovered that the email is sending the existing stock, instead of the quantity to order. Our developer submitted a ticket to ServiceNow, who confirmed that this is the out-of-box behavior. To solve the problem, we are rewriting the email notification in our instance. The downside to this is that if ServiceNow does correct this issue, our changes to the email will prevent the updates from reaching our instance. The good news is that I wouldn’t expect ServiceNow to update the notification – unless they’re fixing this defect. This blog is a continuation of Parts 1 & 2. 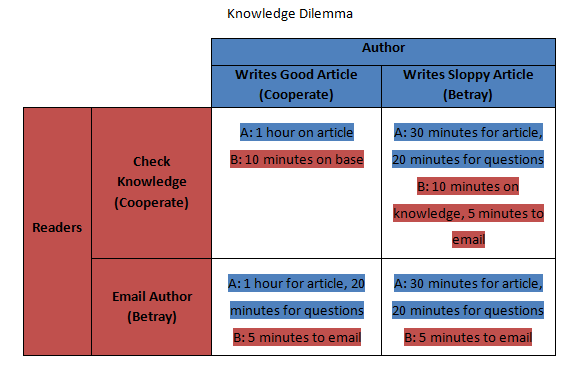 Throughout this 3 part series, I’ve discussed how the ServiceNow knowledge base can resemble the prisoners’ dilemma, bringing about selfish actions that may weaken the effectiveness of the knowledge base as a whole. I’ve suggested multiple ways to curtail this effect, including several organizational change management (OCM) efforts. However, all of these OCM efforts can be rendered meaningless if the quality of the knowledge base starts to drop. Bad content leads to selfish users in the knowledge base. How likely is it that this user will use the knowledge base the next time a question comes up? As a knowledge admin, it’s important to make sure that authors understand this effect of bad content. Bad knowledge articles don’t just negatively reflect on that article – they can sour users’ perceptions of the entire knowledge base, making users less likely to use the knowledge base in the future. As a knowledge admin, it’s important to make sure that authors understand that a bad article doesn’t just reflect poorly on the author, it reflects poorly on the knowledge base itself. To keep the knowledge base running smoothly, knowledge admins need to be the garbage men of the knowledge base – disposing of the trash, and cleaning up the sloppy articles. One way to clean up the knowledge base is to kaizen the knowledge base – have a culture of continuous improvement around your knowledge base. One way to implement the kaizen is to force users to improve sloppy content. In one sense, this could be thought of as the opposite of “rewarding good efforts.” (link to relevant article) If you force an author of a sloppy article to rewrite the article, you are essentially punishing the sloppy writing habits. This will continue to fix the misaligned incentive structure (link to relevant article) – if the author has to spend extra time fixing a bad article, then maybe it would just be quicker to write it well in the first place. But more than that, most sloppy articles are not a product of intentional negligence. A low-quality article may simply be a situation of an author not realizing the standards of a good article. Also, time can cause article quality to decay. An article can become inaccurate or obsolete if it stays in the knowledge base for too long. Like we mentioned above, poor quality articles can destroy users’ faith in the base itself; thus, it is imperative to keep reviewing content to ensure that articles aren’t degrading over time. At my Fortune-500 consumer packaged goods client, we have used a number of methods to maintain high quality articles. Every article goes through two reviews before being published in the knowledge base to ensure that articles are high quality at the get-go. First, they are reviewed for style and grammar by the knowledge admin, and then a subject matter expert performs a technical review. Once an article is published, the author makes use of the built-in feedback tools to help identify articles that may have slipped past the initial review or degraded over time. The knowledge admin regularly checks the feedback of articles to identify flagged articles that need to be rewritten or clarified. Articles that are flagged as inaccurate have an email automatically generated to the author to initiate an immediate review. Finally, all articles are required to be reviewed by the author at least once a year to prevent articles from becoming outdated. The yearly review is initiated using the valid to date. The author can set the valid to date for up to one year in the future, and the author setting the valid to date is his way of verifying the article is currently accurate and will be continue to be accurate until that date passes. When the valid to date gets within a month, business rules automatically fire an email to the author, reminding him to review the article and reset the valid to date if the article is still valid. The act of resetting the valid to date becomes the author’s way of certifying the article is accurate. If the article is no longer accurate, the author is encouraged to either edit it as necessary or retire it. If an author ignores the emails, the article will go past the valid to date, and no longer be visible in the knowledge base. The emails, and the consequence of the article being no longer visible, gives the author the incentives to actually complete the yearly review – often good habits like this one can slip by the wayside if there are no consequences. Because the article can become invisible in the knowledge base, it’s important for the knowledge admin to monitor for articles that have passed their valid to date, and validate whether the author simply forgot to review the article, or if the article is actually outdated and needs to be retired. Hopefully it’s clear that there’s a certain energy that the knowledge base has that feeds on itself. When left alone, this can be a negative energy where authors and readers can be incentivized to “betray” the knowledge base by putting in low levels of effort. This negative energy can incentivize other users to slack as well, causing a negative feedback loop where the usefulness of the knowledge base is continuously declining. It’s up to the knowledge admins to inject positive energy to ensure the knowledge base functions smoothly. As a knowledge admin, you are the garbage man of the knowledge base. You need to make sure the knowledge base stays clean – that junky old articles are either polished up or retired. By injecting positive energy, you can create a positive feedback loop that ensures the knowledge base is running well. By ensuring good buy-in, rewarding good efforts, and implementing systems to improve poor content, this can tip the scales in favor of using the knowledge base correctly. The same way that the negative energy can feed on itself, the positive energy can feed on itself, incentivizing both authors and readers to use the knowledge base to its full capabilities, and saving everyone involved time and energy in solving issues. With this injection of positive energy, you may find less need to police the knowledge base, as people will be fixing their articles as needed. Ultimately, by injecting this positive energy, you can help keep your knowledge base clean as a whistle. Note: This article has also been posted to my company’s insights page. ServiceNow Knowledge Base can be like the Prisoner’s Dilemma. So shift people’s perspectives of the game. This blog is a continuation of Part 1. In the previous blog in this series, I discussed how the ServiceNow knowledge base can resemble the prisoners’ dilemma, due to a bad incentive structure, and discussed ways to change the incentive structure to help users make choices that benefit the knowledge base as a whole. However, there’s an underlying assumption in the metaphor that users are only self-interested, and this selfishness is part of what brings about the poor incentive structure. With any faceless technology, there’s always the threat of users losing sympathy for the other users. As a Knowledge Administrator, it’s important to make sure that users are aware of their other users. By making users sympathetic to their fellow users, the misaligned incentive structure may evaporate entirely, solving the prisoners’ dilemma scenario without needing to directly change the incentive structure at all. Let’s refer back to the prisoners’ dilemma analogy from the previous post. The model above assumes that the prisoners are taking an “every man for himself” approach to their plea deals. There is no sense of comradery or honor between the two prisoners that might encourage them to risk betrayal to help the other one out. And conversely, the prisoners aren’t going to feel any guilt if they betray the other one, causing the other additional jail time (man, these are really some ruthless criminals). Thus, when the criminals make their decision to betray the other, they are only thinking of their own outcomes – they don’t care about the outcome of the other. Similarly, in this theoretical knowledge base, the participants are only self-interested. By writing a sloppy article, the authors reveal that they are not respectful of the readers’ time. Similarly, the readers are not respectful of the authors’ time by emailing them directly, rather than searching for a knowledge base article. How might this happen in a real knowledge base scenario? Are we assuming that all knowledge base users are just jerks who only care about themselves? Is this model realistic for a real-world knowledge base? Probably not to the full extent of this example. However, it’s possible to imagine a scenario where users don’t think of their fellow users as much as they should. With any faceless software, it’s easy for users to forget the other people behind the scenes. How Can Knowledge Admins Deter Self-Interest? As a Knowledge Administrator, it’s important to recognize that the knowledge base incentive structure may resemble the prisoners’ dilemma, encouraging users to behave selfishly. However, if you can change users’ attitudes to think about other users, the prisoners’ dilemma situation may disappear entirely, since users will now act with other people in mind. Ensure that both authors and readers understand the importance of doing their part to the best of their abilities. Using effective Organizational Change Management (OCM) techniques can help users understand the importance of all the different roles in the Knowledge base, and why it’s important for everyone to do their part effectively. With good user buy-in, users can answer the question “What’s in it for the knowledge base?” But more important than that, is making sure that users can answer the question “What’s in it for me?” As a Knowledge Admin, it’s important to make sure that users understand the reciprocal nature of the knowledge base – that by doing their job correctly, it makes others’ jobs easier as well, and vice-versa. By understanding their own personal benefit, it will be much easier to create a lasting change. Being selfish is the lazy way to use the knowledge base. As a knowledge admin, it’s important to set a culture of expecting high standards within the company. Point out examples of the high standards of the company, and encourage users to be proud of that culture. If people feel like they’re a part of something bigger than themselves, they will be likely to go that extra mile to help maintain those high standards. You’ve Users Interested in Others – Now How Do You Keep Efforts High? In the next article in my series, we’ll talk about using Kaizen principles to continuously improve your knowledge base, to help keep users thinking about other users in the knowledge base. Note: This post has also been posted on my company’s insights page. there would only be 2 total years of prison time. However, this scenario tends to end with both prisoners betraying. A double betrayal is what’s referred to as the Nash Equilibrium, which essentially means that this is the most likely outcome (see the link for more information). Imagine that instead of prisoners, the two parties are the authors of articles and the readers of the articles. The parties have two choices, similar to the prisoners’ – they can either “cooperate”, or “betray,” meaning that they can either do something beneficial to the knowledge base, or something more selfish. For the author, this would be either writing a high quality article that includes some of the attributes previously described, or writing a sloppy article. For the reader, the choices would be either checking the knowledge base for the answer, or just emailing the author for the answer. Rather than prison time, the outcomes are measured in the total amount of time that the person has to spend for his portion of the knowledge base. Again, in this thought experiment, there are no outside agents, and the author and readers make their decisions in a vacuum. I’ll discuss reasons 2 and 3 in future articles, but for now let’s examine reason 1 – the incentive structure – from the prisoner’s dilemma and see how it applies to this Knowledge situation. In the classic prisoners’ dilemma, the incentive structure is set up in such a way that can incentivize users to act in a way that’s detrimental to the overall health of the base. It’s important for Knowledge Administrators to recognize this pitfall, and ensure that appropriate steps are taken to remove these temptations. I’ll discuss two ways to fix this bad incentive structure – altering the incentive structure, and changing users’ perceptions of success. The other way to change the incentive structures is to change authors’ perceptions of the incentives. The assumption we’re using above is that users are only thinking about how to minimize the time that they individually spend in the knowledge base. But what if you can change the users’ perceptions, and have them not be only focused on their own time, but of the total time spent in the knowledge base. This can make a huge change to the fundamental incentive structure. I will discuss how to make this shift in Part 2 of this series, which will be released soon. In the next post in this series, I’ll discuss how to shift users’ perceptions of the incentives of knowledge – to get users to think of the entirety of the knowledge base, not just themselves. Note: this blog has also been posted on my company’s insights page. Check them out for more information and insights on ServiceNow and other technologies!